I love pasta. It provides a fantastic palate on which you can paint a gorgeous flavor picture. The possibilities are endless. Today’s recipe is a variation of another recipe whose origin I cannot remember. This is vegetarian though adding chicken would up the heartiness and flavor. Cook pasta in large pot of boiling salted water until al dente. Heat oil in large nonstick skillet over medium-high heat. 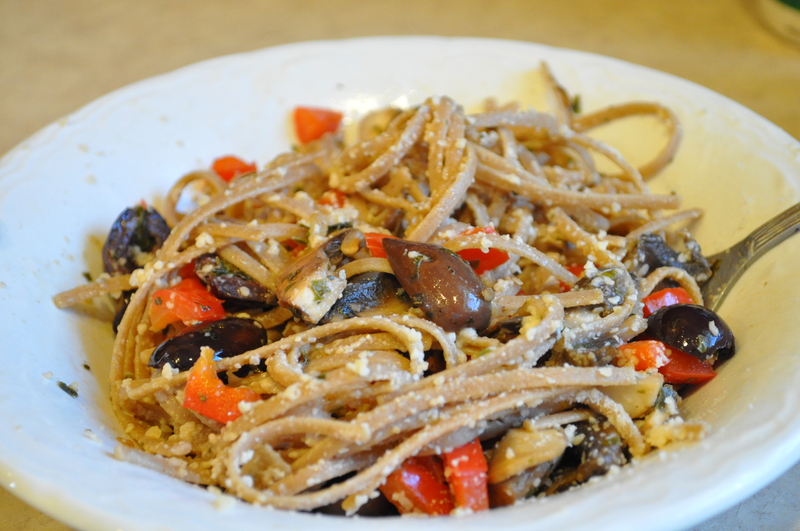 Add bell peppers, olives, garlic, crushed red pepper, and mushrooms. Sauté until bell peppers are tender, 4 to 5 minutes. Add drained pasta, 1/2 cup reserved pasta cooking liquid, 1 cup basil, 1 cup cheese, and vinegar. Toss until sauce coats pasta, adding more reserved cooking liquid by 1/4 cupfuls if dry, about 1 minute. Season to taste with salt and pepper. I love pasta too and this looks like a great weeknight meal, or any night really.